If you are looking for cheap and greasy Chinese food, this is the place in Edmonton to get it. Double Greeting has been around for longer than I can remember. I ate here as a kid, and I still eat here as an adult. It’s one of those places that look a little dingy but has a steady set of loyal customers – both Asian and non-Asian. The key to ordering here is to stick to noodle and rice dishes. Won ton too, of course. The congee is okay too. 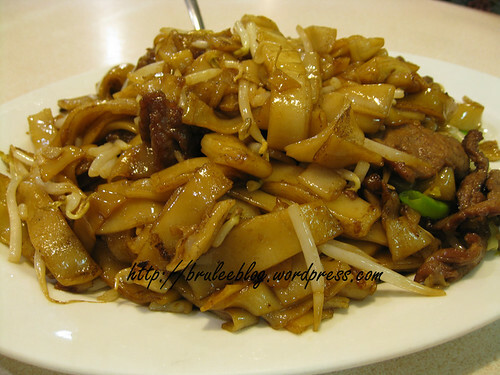 Beef chow fun is one of my standby dishes at noodle cafe such as Double Greeting. There are variations of it that you can order – seafood instead of beef, more vegetables, etc. This is one of the dishes that I use as a bellwether to test the quality of food at a restaurant. Double Greeting’s beef chow fun has lots of tender beef, lots of bean sprouts (but not too many), the noodles are firm but soft and not at all gluey, and the dish has enough grease on it to make the noodles shine but not so much as to make it taste really oily in your mouth. Oh, and see the slight char on the noodles? Yum. Another dish that I order a lot – mostly because I like it and not because I use it to judge the food at a restaurant – is salted fish and chicken fried rice. 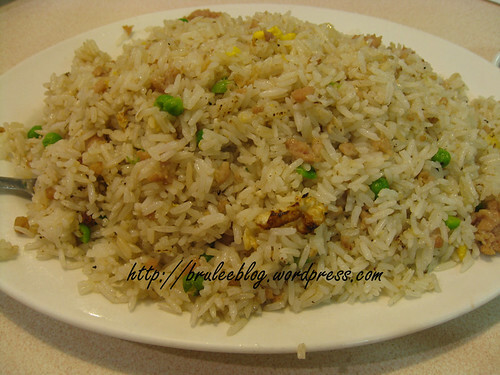 A good version of this dish will have a little bit of egg, small to medium sized chunks of tender chicken and plenty of shredded salted fish scattered throughout the rice. Too much fish means the rice is oversalted, and too little fish will mean the rice is bland. I was let down by Double Greeting’s version of this dish. It wasn’t greasy, which was good, but they skimped on the salted fish and as a result the rice was bland and I was craving flavour. I would rather have Spicy Garden’s version. If you are in the mood for rice at Double Greeting, I suggest trying the pineapple and chicken fried rice instead of the salted fish and chicken. I recently stopped at Tropika for a meal, and picked a few things off their menu to share. Unlike in Malaysia, these portions are quite large. 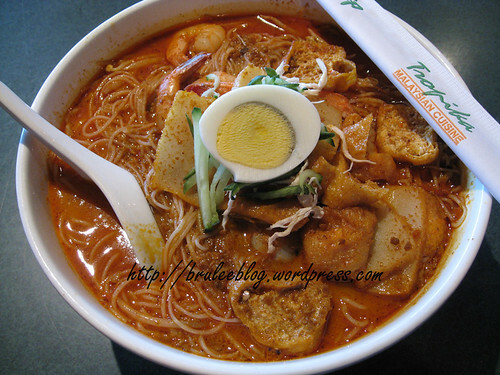 An order of Singapore laksa (made with what looks like a red curry as opposed to a yellow curry) can feed 2-4 people. The flavour of it was good but it was disappointing to find that the majority of the bowl was made up of noodles. It would have been nice to have more sliced of fish cake, tofu puffs, shrimp and bean sprouts. Their roti canai is light and fluffy; I would say lighter and fluffier than the ones I ate in Malaysia. The accompanying curry sauce is, like their laksa, more of a red curry than yellow. Their satays (chicken and lamb pictured here) are seasoned well and come with a dish of spicy peanut sauce, pineapple and cucumber. The peanut sauce is probably the best part of this dish. Tropika is pretty much the only Malaysian restaurant in Edmonton. I wish there were more choices, but you make due with what you’ve got! I tend to stick to a few specific dishes such as the ones I ordered, or perhaps picking up some mee goreng instead of a laksa. Their pineapple fried rice, served in half of a pineapple, is a great dish for kids or for adults who are looking for something without heat. If you want to try Malaysian food, I would suggest going to Tropika (and staying away from the Thai dishes as there are better places to have Thai food in Edmonton), or try the handful of Malaysian dishes over at Matahari on 124 st.